Home Make Money Blog How to Earn Well by Becoming a Private Lender Online? There are several ways to earn money online, but one of the trending methods of doing so is to become a financial advisor or a loan provider, and today, we shall explore the nitty-gritty of the latter in detail. Websites are a great platform to buy and sell products, even financial products, such as credit cards, insurance schemes, loan schemes etc. Once you become a registered lender, you can offer unsecured and secured loans to borrowers. One of the best ways to tap the fund-needs of customers is to reach them on the internet via your loan-providing website and social media channels. It is quite a lucrative business these days, especially when people of all economical backgrounds are looking for emergency cash to fulfil their needs. 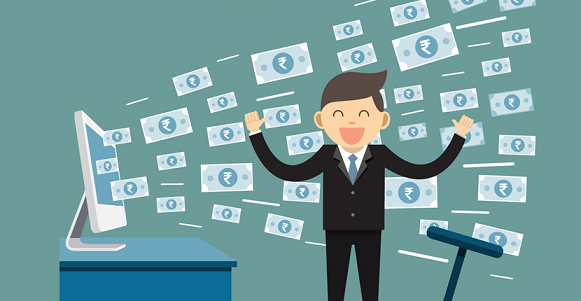 Here is how you can use the internet to earn handsome amount of income every month by becoming a private lender online. Providing financial support to others is a big responsibility and carries a lot of risk. You have to weigh your options before selecting the type of loan you are equipped to provide. A collateral-loan such as that against gold or any asset is a safer option, if you are wary of providing collateral-less loans such as personal loans, payday loans etc. Select financial products that you are sure of. For instance, if you can provide a loan of Rs. 5 lakhs every month then you need to spread the risk. Giving all the funds to just one borrower could be risky, especially if you are selecting one with an average credit score. Keep the content easy to read and understand and steer off from using any vague language. The action buttons especially that for loan application, loan application form, links, and other functions should work smoothly. Test all the pages and functions before making the website live. You may need some support to establish your website if you do not know how to get it live and functional yourself. You may seek help from fellow website designers, web developers, software testers, content writers, product managers, etc to give your website a professional look and get it together. Not only that, you should have a knowledgeable and prompt customer support team to answer to the queries and deal with probable borrowers. You need to get the business registered. But this is just the beginning. If you plan to use a unique logo for your business, then you need to get a trademark for the same. Hire a legal team that can help you out with the process. Create a brand identity but not by compromising any laws and rules. Be strict about the deadlines and repayment tenure. Get a loan agreement signed, mentioning all terms and conditions, fees, charges and penalties applicable so that there is complete transparency. Establish a payment mode for EMI and provide funds in time to the borrowers, and recover the same from them when the time arrives. There are many aggregators that partner with banks and NBFCs and act as facilitator to connect people with financial products’ providers. You can become an aggregator if you yourself do not wish to become a direct lender. If you are low on investment, yet plan to make money, then you can always provide a small cash loan for a short-term to borrowers, and make a decent earning. A small cash loan is usually disbursed within 24 hours of the loan application. The amount is small, anywhere between Rs. 10,000 to Rs. 50,000. SEO marketing and Social Media marketing are your buddies when you launch a service-providing website. However, you can introduce the platform to your friends and family members by word of mouth as well. Drop them an email or text about it, tell them about your initiative on call, and maybe you will land up with more clients. Especially in money lending sector, trust plays a vital role and people would trust someone they know anytime more than a stranger when it comes to monetary help. When competing against banks and NBFCs, you need to take make sure the interest rate you charge on the loan is as per the RBI norms and regulated. An ideal way to get the best returns is to charge nominal rates in the initial stages before growing your clientele. The rate you charge should be influenced by the amount of profit you wish to generate and income/personal profile of the borrower. You can charge a higher rate of interest to high-risk borrowers, and vice-versa. The above-mentioned tips will definitely enable you to get started at becoming a successful private online lender. Do go through these and share your feedback with us.